It is hot, hot, hot in our neck of the woods and the summer heat has caused me to turn my back on the kitchen and seek refuge in take-out and air-conditioned restaurants several times this past week. Even today the temperature was already eighty degrees by ten this morning which means by dinner time it will still be hovering around 100. But with a big bag of basil in the fridge it’s time to get back in the kitchen. I hate to think that it would go bad just because I don’t want to turn on the stove, so I decided to start making dinner in the morning before the heat of the day sapped my energy. With lots of fresh basil I decided to make a decent sized batch of pesto, which is super easy to make. 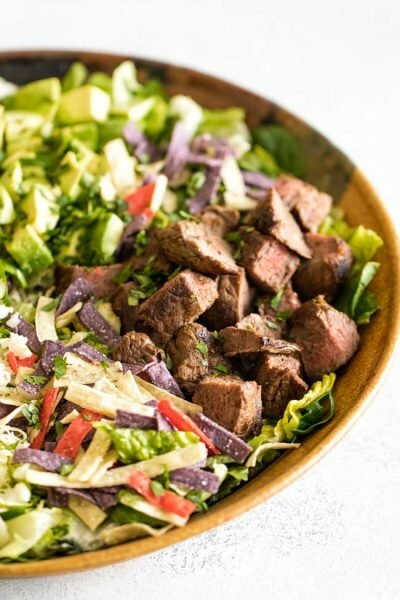 It’s also versatile and can be used in a variety of ways– as a salad dressing, tossed with pasta, or as a sandwich spread are just a few ways to use it. 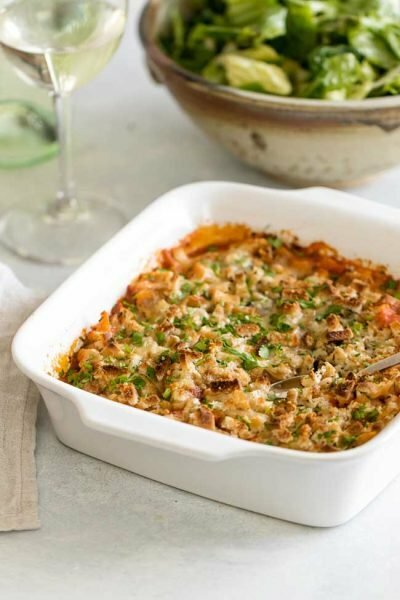 If you make a big batch you can freeze some of it to have on hand for a quick dinner on those nights that cooking dinner seems out of reach. 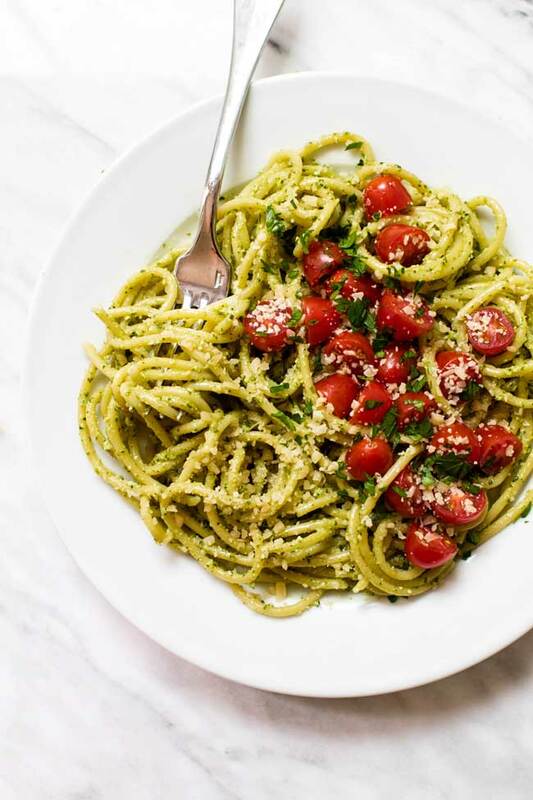 I used to buy premade pesto at the store until I figured out how easy it is to make. Once you know which ingredients to use and in what amounts you don’t even need a recipe. None of my pestos are ever the same because sometimes I add more garlic or maybe fewer pine nuts, it really depends on my mood. This time I decided to roast the garlic instead of using it raw. Roasting garlic mellows out the flavor, which is a nice addition to the pesto. Also, roasting it means you’ll want to use more so, if you are using raw garlic I recommend using one clove for every cup of fresh basil. Not wanting to use my oven I turned to the grill to roast it, which is the only cooking involved in the recipe. I preheated the grill to medium and, once heated, I turned off one side so the garlic could roast over indirect heat. I used one whole head of garlic, removed most of the paper, and cut the top off. I drizzled it with olive oil and a pinch of salt and pepper. Then I wrapped in tin foil and let it roast for about 40 minutes until the cloves were soft. Once it cooled I squeezed out the cloves. Once the garlic is done it’s just a matter of pureeing all the ingredients in a blender or food processor. 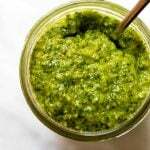 Toss the pesto with pasta, spread it on sandwiches or thin it with additional olive oil and use it as a salad dressing. So now we have a roasted garlic pesto sauce that we’ll use for dinner tonight. At this point, I’m not quite sure what it will be, but I’m pretty sure it won’t involve the oven. Roasting garlic mellows its sharp flavor and is a great way to use up extra heads of garlic hiding in your pantry. 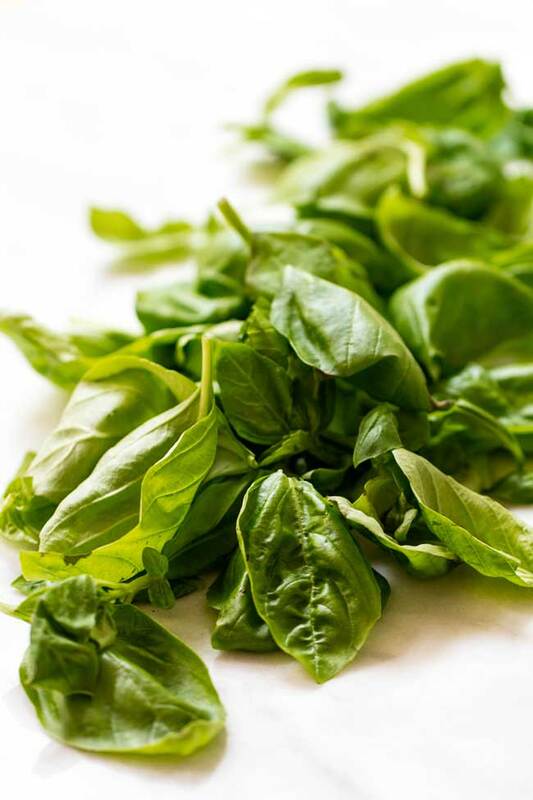 Mix it with nuts, fresh basil, Parmesan cheese, and lemon and you get a pesto that’s perfect for pasta. Oven Method: Preheat the oven to 425 degrees. Place the wrapped garlic directly on the rack and roast for 30 -40 minutes. Outdoor Grill Method: Preheat the grill to medium-high heat. 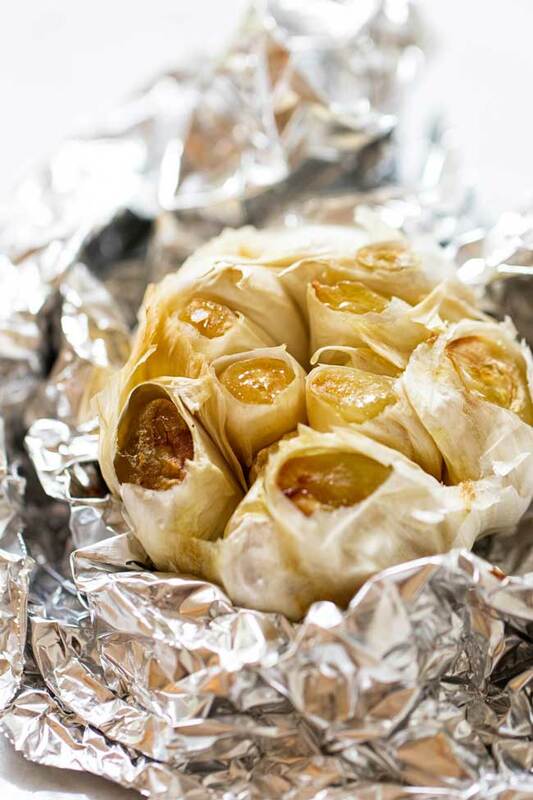 Place the wrapped garlic directly on the grill, close the lid, and roast for 30 minutes. 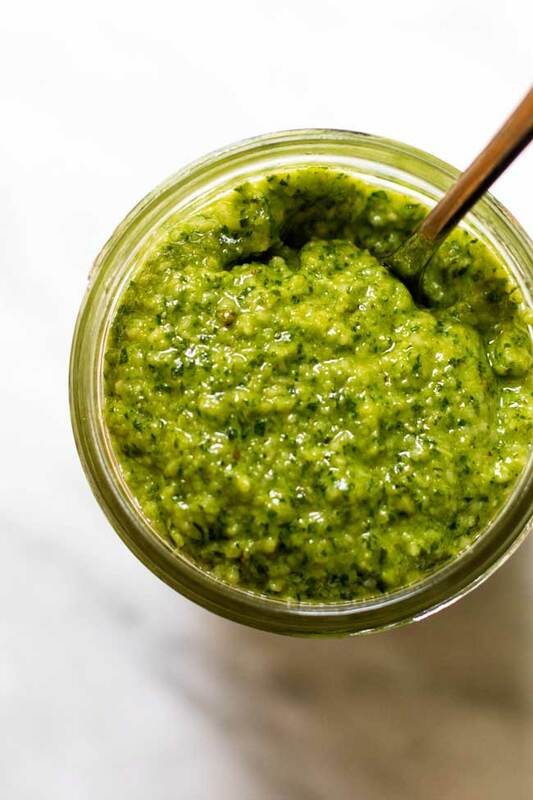 Make the Pesto: Once the garlic is cool enough to handle, squeeze it to extract the roasted cloves. 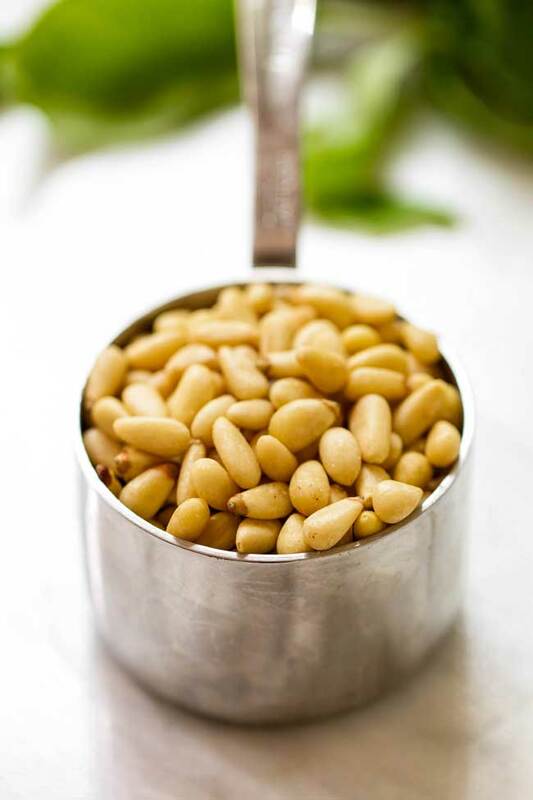 Place the roasted garlic, basil, pine nuts, salt, lemon juice and Parmesan cheese in a blender or food processor. Pulse a few times to chop and mix the ingredients. With the machine running, slowly add 1/3 cup of olive oil. Check for salt and add additional, if necessary. Makes approximately 1 cup. Pine nuts are expensive so I often substitute walnuts or slivered almonds when I don’t feel like dipping into my savings account for a half a cup of pine nuts.